Duplex Dead Center Bullet - Shoots a .357 caliber Dead Center bullet from your 50 caliber muzzle loader. A seemingly crazy idea that seats a high BC .357 caliber Dead Center bullet into a sabot-within-a-sabot. 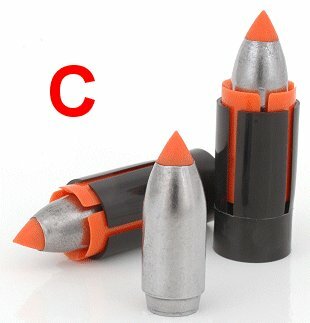 Available in 175 and 195 grain bullet weights, these lighter bullets shoot at velocities in excess of 2100 fps with 100-120 gr of Triple 7. Aim dead-on out to 200 yards, and hit fine at 250-300 yds with a slight hold over. This is the bullet to choose when hunting open country and using a telescopic sight. Read more at our Dead Center Page. Took my 12 yr old nephew hunting with a CVA wolf with the 175 grain dead center bullet. I wanted a load that had moderate recoil for a small boy. The bullet is extremely accurate in this muzzleloader and the recoil is noticeable reduced. Give it a try if you are looking for a reduction in recoil in a muzzle loader. He killed his first deer with this bullet at 70 yards with a pass through and it fell in it's tracks. Took an 8 pointer last year with a 30 yard shot. No knockdown, but piled up within sight, <100 yards. wasn't sure about double sleeve but proved reliable; shoots far, straight and true. Will buy again and use as primary load.